Dhoti pants for women are named after the traditional garment “dhoti” worn by men in India. Ancient sculptures also depict women wearing dhotis wrapped in some very exotic traditional manner. The garment resembles in shape and silhouette exhibited by dhoti worn by men in India. A dhoti pant drapes loosely only at the upper leg area and tapers gradually towards the hemline. The area of gathered fabric for dhoti pants is great. New versions include more cropped and tapered versions. The difference remains that dhoti pant for women is a stitched ready-to-wear and easy-to-wear garment whereas a typical Indian dhoti needs to be wrapped by folding and tying a 5 yard un-stitched rectangular piece of cloth, cotton or silk, that is generally white in color. An ideal length for dhoti pants lie just above the ankle. Dhoti styles that are extra-deep are highly in vogue. 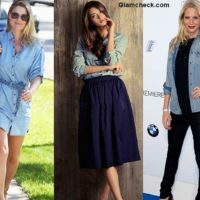 Variations may include front or side zippers or buttoned ends. Some may feature very moderate crotch depth or the original rapper styling. They are made of soft draping fabrics like muslin, cotton or silk to ensure better drape and greater comfort. Georgette, crepes may also allow free drape. What makes them so popular is the freshness and novelty that the silhouette offers. 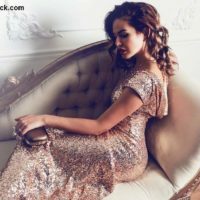 The semi-formal wear can be worn for a relaxed evening. 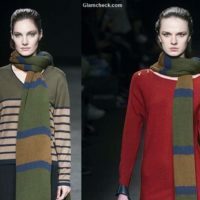 They are easy summer wear that may also prove to be apt for travel, casual looks and comfort. 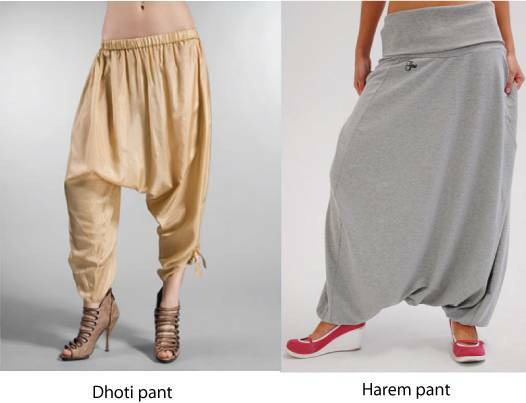 Don’t confuse dhoti pants for harem pants. They appear similar in silhouette due to the airy and loose draping pattern. Dhoti pants are loose only at the upper leg which is the thigh area. They start tapering gradually thereby. Harem pants are airy and loose throughout the leg area except at the hemline. The area with gathered fabric is more for dhoti pants and less for harem pants. 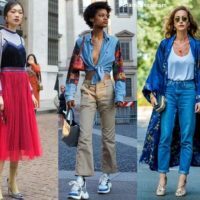 An ankle length dhoti pant may be loose up to the thighs and remain gathered and sleek below the knees and up to the hemline at the ankles. 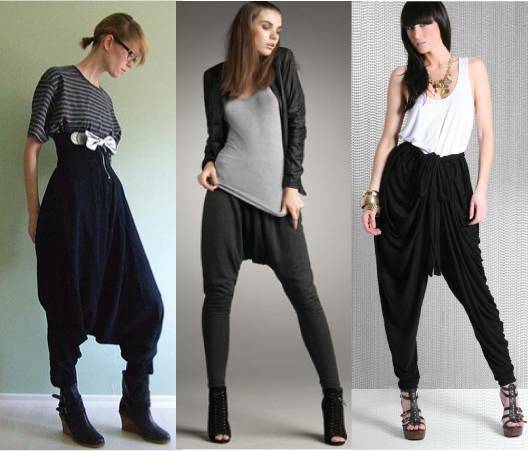 But harem pant of ankle length will remain loose throughout and get gathered only at the hemline.